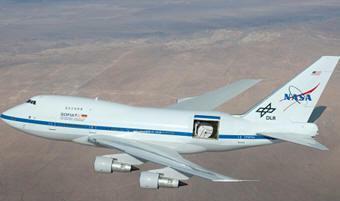 April 9, 2011 - The Stratospheric Observatory for Infrared Astronomy, or SOFIA, completed its first science flight Wednesday, April 6, using the German Receiver for Astronomy at Terahertz Frequencies (GREAT) scientific instrument. GREAT is a high-resolution far-infrared spectrometer that finely divides and sorts light into component colors for detailed analysis. SOFIA is the only operational airborne observatory. It is a joint program between NASA and the German Aerospace Center (DLR). The observatory is a heavily modified Boeing 747SP aircraft carrying a reflecting telescope with an effective diameter of 100 inches. Flying at altitudes between 39,000 and 45,000 feet, above the water vapor in Earth's lower atmosphere that blocks most infrared radiation from celestial sources, SOFIA conducts astronomy research not possible with ground-based telescopes. "SOFIA's onboard crew seamlessly combined scientists, engineers and technicians from the U.S. and Germany, working together on an observatory developed in the U.S., using a telescope and instrument built in Germany, to gather data of great interest to the entire world's scientific community," said Bob Meyer, NASA's SOFIA Program manager at the agency's Dryden Flight Research Center in Edwards, Calif.
GREAT Principal Investigator Rolf Guesten of the Max Planck Institute for Radio Astronomy in Bonn, Germany, and his team conducted observations high above the central and western United States beginning the night of April 5 with their instrument installed on SOFIA's telescope. Among their targets were IC 342, a spiral galaxy located 11 million light-years from Earth in the constellation Camelopardalis ("The Giraffe"), and the Omega Nebula (known as M17), 5,000 light-years away in Sagittarius. The team captured and analyzed radiation from ionized carbon atoms and carbon monoxide molecules to probe the chemical reactions, motions of matter and flows of energy occurring in interstellar clouds. Astronomers have evidence such clouds in both IC 342 and M17 are forming numerous massive stars. "These first spectra are the reward for the many years of work creating this technology, and underline the scientific potential of airborne far-infrared spectroscopy," Guesten said. GREAT focused on strong far-infrared emissions from interstellar clouds that cool the clouds. The balance between heating and cooling processes regulates the temperature of the interstellar material and controls initial conditions for the formation of new stars. "These observations give us unique information about the physical processes and chemical conditions in the stellar nurseries," said Juergen Stutzki, a co-investigator on the GREAT team. "SOFIA will give us new and deep insight into how stars form." GREAT, one of two German first-generation SOFIA scientific instruments, was developed by the Max Planck Institute for Radio Astronomy and the University of Cologne in collaboration with the Max Planck Institute for Solar System Research and the DLR Institute of Planetary Research. "This first science flight with a German instrument is a huge milestone for the SOFIA observatory," said John Gagosian, SOFIA program executive at NASA Headquarters in Washington. "GREAT, in combination with SOFIA's other German and U.S.-developed instruments, demonstrates SOFIA's extraordinary versatility, allowing it to play a unique and essential role alongside the Spitzer and Herschel spacecraft." NASA's Ames Research Center in Moffett Field, Calif., manages the SOFIA science and mission operations in cooperation with the Universities Space Research Association headquartered in Columbia, Md., and the German SOFIA Institute at the University of Stuttgart, Germany. SOFIA is based and managed at Dryden's Aircraft Operations Facility in Palmdale, Calif.